We know time is critical when pets are sick. We have an in-house lab which is state of the art. 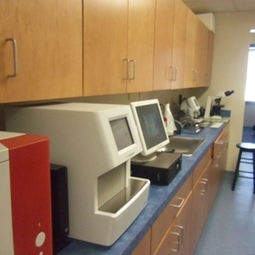 With this equipment we are able to perform bloodwork including, a full chemistry profile, complete blood count (CBC), thyroid screening, pancreatitis diagnostics, liver screening, annual screening for heartworm, lyme disease, erlichia and anaplasmosis (two other tick borne diseases common to this area), and urinalysis among other tests for same day results. We also submit specimens daily to IDEXX Laboratories. Most lab results are received the following day.